Marjory Johnson was the wife of Charles K. Johnson, leader of the Flat Earth Society from 1971 until his death in 2001. 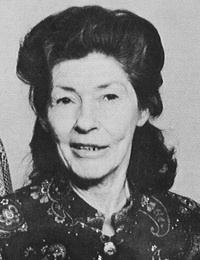 Marjory, a native Australian, met Charles in 1959 in a San Francisco record store. They were eventually married and Marjory moved to the United States. Marjory acted as Secretary for the Flat Earth Society. She also was a regular contributor to the Flat Earth News. A vegetarian and animal rights advocate, she often wrote about her anti-vivisection stance. After suffering serious health problems in her later years, Marjory Johnson died on May 19, 1996. This page was last modified on 3 May 2014, at 12:06.